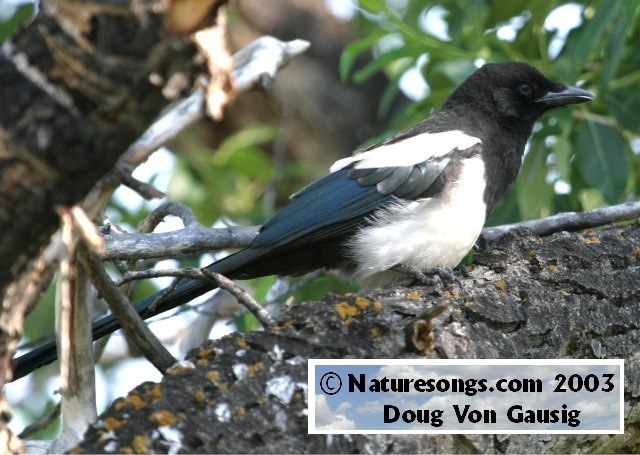 Remember, all sound clips, text and photos are copyrighted to Doug Von Gausig and Naturesongs.com. Non-commercial use is usually granted without charge, but must be in writing from the author. Commercial use is expressly forbidden without prior written consent. Click on the Camera Symbol to see the photo. A Northern Beardless-Tyrannulet (Camptostoma imberbe) (9 sec., 190K) sits in an Arizona Ash tree at Buenos Aires Nat'l Wildlife Refuge and sings his mournful song. This little guy is the size of an Empid with essentially no distinguishing characteristics, but his song gives him away. He is called "beardless" because he lacks the prominent rictal bristles that most flycatchers have around their mouths. In this sample I have cut some of the silence between songs - it normally runs about a minute or so. 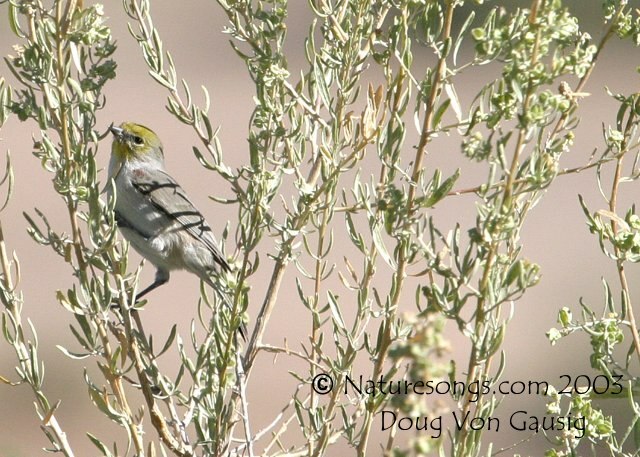 The Greater Pewee (173K, 11 sec) (MP3, 30 sec., 89K) (Contopus pertinax), formerly known as Coue's Flycatcher, is a southwestrn US specialty that summers in the mountains of central Arizona. These recordings were made on Mingus Mountain at about 7500' (2300M) elevation, 5/00. Listen for the characteristic "José Maria" song. The Southwestern Willow Flycatcher (Empidonax trailii extimus) (238K)(MP3 17 sec 49K)is an endangered "Empid" that breeds in the riparian Willow/Cottonwood/Salt Cedar thickets. This pair was recorded along the Verde River near Camp Verde in central Arizona on 5/30/98. If you hear this easily distinguished "Fitz-bew" song, please let me know. This bird is a victim of Cowbird parasitism and habitat reduction and is on its last legs! 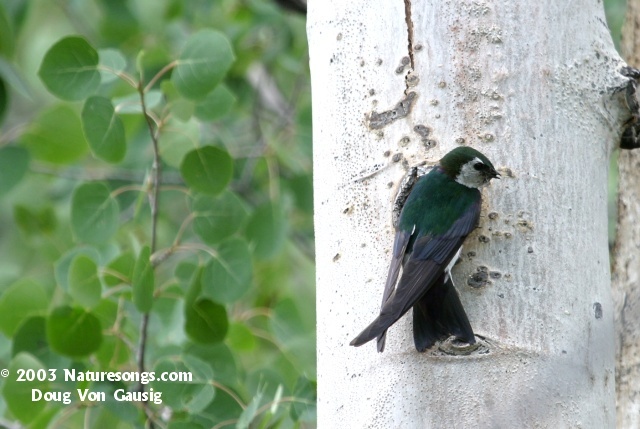 For more info on this species, visit the Southwestern Willow Flycatcher Home Page. Instrumental in having the bird added to the endangered species list is one of my most admired environmental organizations - the Center for Biological Diversity (formerly the Southwest Center for Biological Diversity). A pair of Vermilion Flycatchers (Pyrocephalus rubinus) call to each other one spring day near Pinal Air Park, Arizona. These birds are some of the most beautiful on earth - at a distance they are red flares flitting about! (58K) When things get really heated up in the spring the male displays and sings for the female, as she sits admiringly on a nearby branch. His display flight is a fluttering, puffed-up display that shows off his brilliant plumage to its best advantage, and he sings this song (136K) while flying. 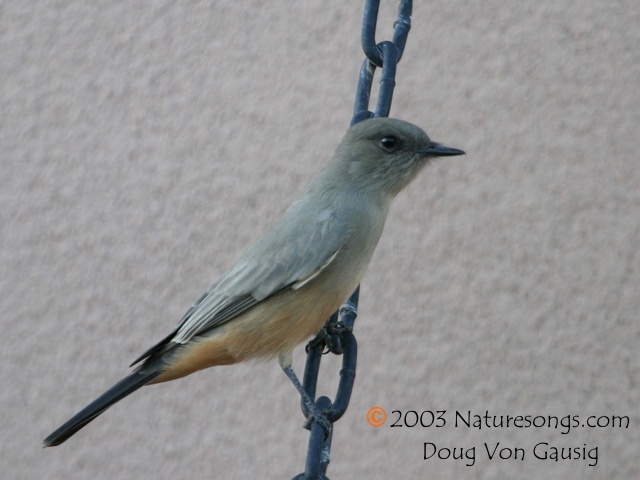 Ash-throated Flycatchers are common summer residents in the Verde Valley of Arizona. This is a pair of them talking to each other as they flit around the mesquite near Tuzigoot National Monument, 5/29/99. (142K, 6.6 sec) (MP3, 17 sec, 50K) In this sample a new parent sits in a Juniper and talks to his (or her) single adolescent. You'll know the youngster when you hear it. (67K) Here, a single bird sits in the chapparal and "sings" (42K). 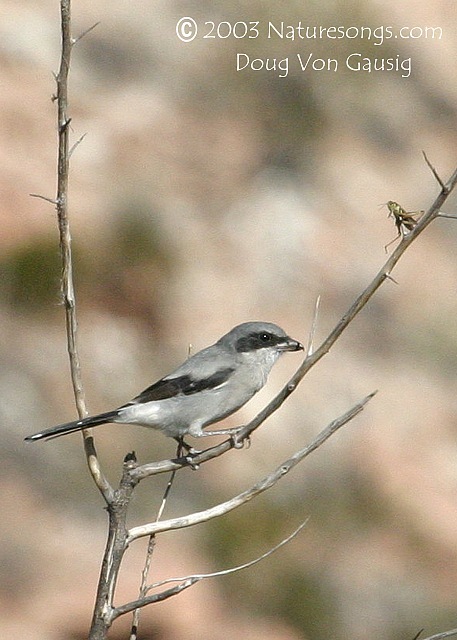 This Loggerhead Shrike (Lanius ludovicianus) was chattering at Tavasci Marsh, 9/98. He was a long way off when I got these recordings, so please excuse the low signal/noise ratio. (133K). Note in the photo that he has impaled a grasshopper on the thorn above him for later dining. This is typical behavior for shrikes. We we used to call them "Butcherbirds" for that reason. In the Springtime the Hutton's Vireo (Vireo huttoni) sings this monotonous diatribe. This one was in Big Sur State Park, central California, in late March, 1999. Thanks to Steven Hopp and Kevin Colver for help in confirming the ID! (82K) Here are two more examples of the call notes, from two different birds near Monterey, California, 3/99. (77K) This bird (154K) was recorded in the Buenos Aires NWR, March 21st, 2001, in extreme southern Arizona. It is a member of the "stephensi" group of Hutton's Vireos - a group that has a completely separate range from the West Coast forms. Here's a remarkable recording of a huge flock of Pinyon Jays (Gymnorhinus cyanocephalus) which flew over my room at Grand Canyon, Arizona, December 12, 1997. These Jays often flock together, but this flock was extraordinary. There were perhaps 1000-1500 birds together, all calling at the same time. It's difficult to estimate large numbers, but the flock flew over me for just over 60 seconds, and was at least 50 meters wide, solid with birds! 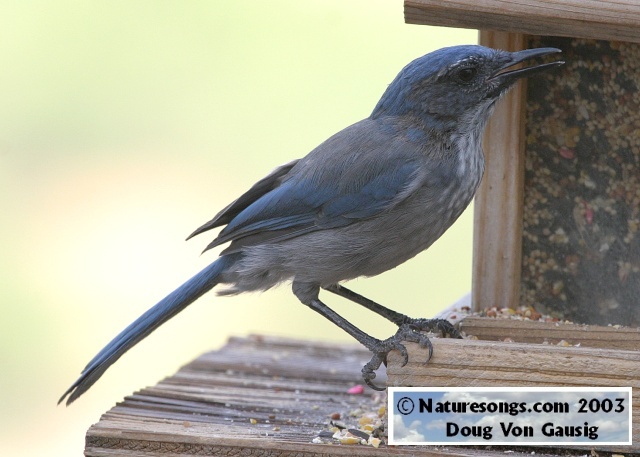 (109K) Here is the call of a single Pinyon Jay (34 K, 1.6 sec). In late February I was fortunate to find a gathering of Ravens consisting of over 200 birds! The gatheriung appeared to be a lek, where young, unattached males compete for the favors of the unattached females. The birds wheel and dive, roll, spin and generally show off, many holding twigs and sticks in their beaks while they fly. Their acrobatics took my breath away, and this recording is some of the wing sounds of one those wild flights (167K). Here is a sample of their calling en masse (104K). If you know more about Raven leks or if you'd like to hear more about this one, please e-mail me. Again in February, this time in 2001, I was fortunate enough to find and record a roost of Ravens near Sedona, Arizona. I've posted a page of on-going observations of this roost, where you can also hear the extraordinary and unique vocalizations that are used for the nightime ritual. Click here to go to that page. The Horned Lark (Eremophila alpestris) is resident of the high prairies around Prescott Valley, Arizona, where Jim Morgan caught this one with his new Telinga microphone and Sony MiniDisc! This is a Spring song recorded in late February, 1999. (121K) Here is the flight song of a small flock (76K). 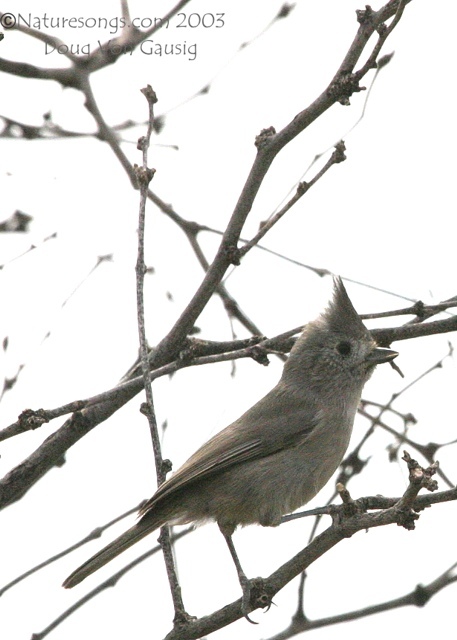 The courtship song of the Bridled Titmouse (Baeolophus wollweberi) is heard in the Cottonwood thickets in riparian habitat in Central Arizona beginning in April. This example was recorded at Tavasci Marsh, April 9, 1998. 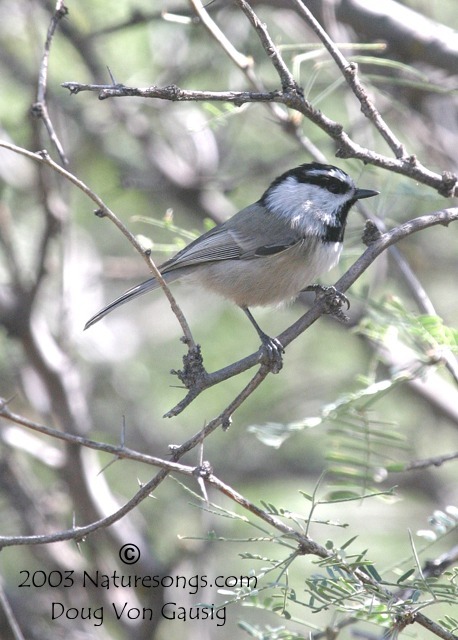 The normal song is a buzzing, Chickadee-like sound heard in this sample, recorded in Central Arizona, 4/11/99. (114K) (MP3, 13 sec., 52K) Here's another sample of their calls (238K) - this one recorded in Ramsey Canyon of SE Arizona, 3/21/00.